This beautiful thatched cottage is in a gorgeous location on a spit of land close to Biesbos National Park. Since the house is largely surrounded by water, you have a wonderful view from here. You are guaranteed to see a lot of birds, and maybe even a beaver. From the garden you can cast off to do some fishing or dock a small boat. 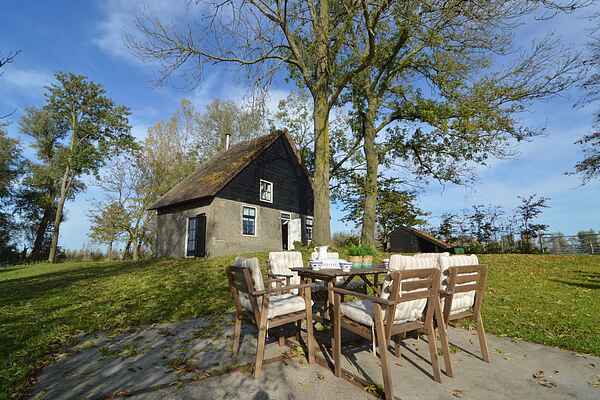 The interior of this nature cottage is furnished in a very cosy design with a lovely ambience. The cottage is heated by a woodstove, with an electric heater for backup. Your privacy is guaranteed since the house is completely off by its own, situated between the fields and the water. A perfect spot to really unwind and enjoy nature. And of course there are some lovely hikes and bike rides starting from the cottage. The house includes a bike shed where you can safely store your bicycles. There is a charming marina at Drimmelen where you can hire a boat to explore the Biesbos, join excursions or ride along on a tour boat. The fabulous city of Breda is about 18 km away, where you will find a wide selection of shops, restaurants and nightlife venues.